Alien shark warriors threaten to invade the earth from a secret portal under the ocean. Find it before it's too late! 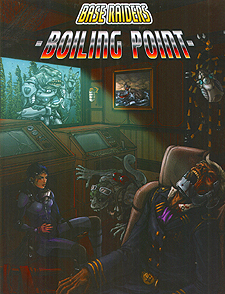 Boiling Point is an adventure for the Base Raiders role playing game. It begins with an investigation of a new drug dealer. Lukas has been selling super soldier drugs acquired from a mysterious base. The player characters are asked to find the base by finding Lukas. The base was the underwater home of a superhero named Hot Water, who has since disappeared. He left behind a treasure trove of gadgets and a portal to another universe. A race of alien shark warriors has escaped from the portal. So far, they are trapped in the base, but that won't last long. New Enemies and Allies: The Selachius are a dangerous species of alien shark-like warriors. Equipped with high technology and magic, only the strongest or cleverest heroes can beat them. Recruit the robot guardians of the base to help fight the aliens. New Superpowers: Loot alien weapons, mystic artifacts, and other new sources of superpowers. Traps: Deadly traps will decimate the foolish or slow. Fully Illustrated: Every Major section is mapped out and NPCs are depicted.